by Scott Strong and Tucker Balch, Ph.D.
Lucena Research has evaluated the InsiderInsights Company Ratings database as an information source for an event-based study. In this white paper we provide a brief background concerning insider trading information, implement an event study with the data and conclude with back tests to assess the effectiveness of the information in trading. If you need financing for your business click this to learn more about small business loans. Overall, our analysis shows that the data provided by InsiderInsights has persistent and meaningful value, and as such, Lucena will offer this as a premium data source on our QuantDesk™ platform. It should come as no surprise to anyone that insider trading occurs every day in the stock market. What might surprise investors is that most of it is done with the full knowledge and sanction of the U.S. Securities and Exchange Commission (SEC). While for the next plc share price trading is listed on the London Stock Exchange and is featured in the FTSE 100 Index. This isn’t the sort of insider trading that has made Ivan Boesky infamous. He profited from trading on material, non-public information provided to him by a network of informants. The activity we refer to is the trading by directors and executives in their own companies’ shares. This “insider trading” is not only legal, it is reported by executives to the SEC via a document called a “Form 4“. This legal insider data, and that provided by other SEC documents, is a great source of investment ideas no matter what style you prefer. It’s also invaluable for following stocks you already own. After all, who’s in a better position to know a company’s prospects than its own management? Corporate insiders obviously have access to the same material, non-public information that sent Mr. Boesky and his friends to jail–only they can act on it in many cases! Obvious abuses by corporate insiders, such as purchasing large amounts of shares just before their company is acquired at a premium, still aren’t allowed, of course. Most publicly traded companies now also have internal guidelines that only allow their executives to trade during certain “windows” of time. But an executive can hardly forget what he or she saw in the last sales report or heard in the last strategy meeting when on the phone to a broker. There is undoubtedly plenty of important, non-public information influencing insiders’ investment decisions regarding their own firms’ shares. There are also coupons from ATT.com which can give you discount on your phones. By analyzing the Form 4s filed at the SEC, you may not know what these insiders know, but you can certainly know what they do. And this information is arguably just as good. Academic studies have proven that this SEC data is useful for garnering “excess returns” in stocks. A more important testimony comes from institutional investors, many of whom have successfully used the SEC’s insider data to help make their investment decisions for years. The key hypothesis of this work is that legal insider trading activity, whether buying or selling, reveals information that can be used to predict the future performance of the associated company. If true, this supports a conclusion that, given recent insider trading activity information, a profitable trading strategy can be created. Introduce the concept of event-based analysis applied to finance and apply it to the InsiderInsights Company Rating data. Determine a suitable purchasing trigger and holding period based on event analysis results. This research builds on the concepts presented in work by J. H. Lorie and V. Niederhoffer of the University of Chicago (1968) and many others suggesting “that proper and prompt analysis of data on insider trading can be profitable”. In their study, it is asserted that insider trading activity, particularly an accumulation of insider buying, has a persistent and positive impact on the stock price up to six months into the future. In addition, Lorie et al. call for the SEC to “provide faster and more complete dissemination of insider trading data” to allow for a more actionable data source. In our research we confirm that, with a prompt and accurate data feed provided by InsiderInsights, we can indeed create a profitable strategy using insider trading information. The InsiderInsights data that is used for this research is an aggregation of many different data points into a single company rating on a particular date in which significant insider trading activities took place. Figure 1: Insider trading signal values provided by InsiderInsights for trading events. 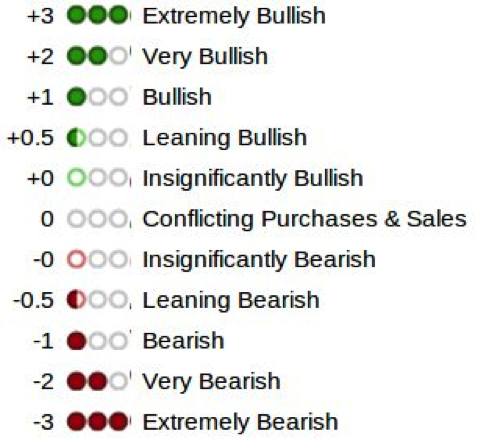 All of these factors are then mapped to a rating scale from -3 (Extremely Bearish) to 3 (Extremely Bullish) as shown below in Figure 1. Additionally, we use stock price/volume data from a separate data provider which supplies daily close information adjusted for splits and dividends. Overall, this study includes data spanning 10 years, from 2003 to 2013, using nearly 4,600 symbols and over 13,000 individual ratings. The basic drive of this research is to determine if information exists in the ratings that were created from the InsiderInsights raw data. To accomplish this, we use a technique introduced to finance by A. C. MacKinlay (1997) called event studies or event-based analysis. An example of this technique is depicted in Figure 2. 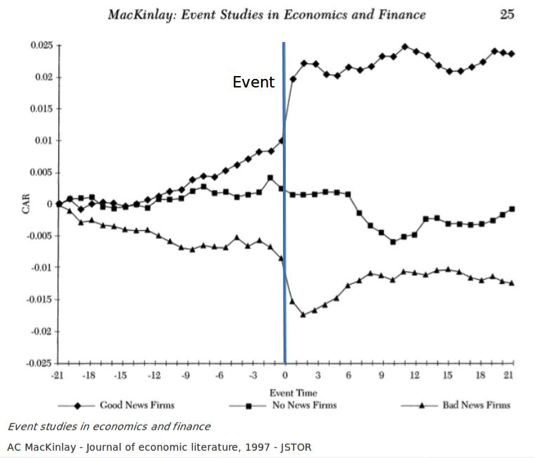 It can be seen that after the day of the event (Day 0), firms having positive news events do better on average in future return when compared to firms that have no news (the opposite is also true). Figure 2: Example event study based on news relating to stocks. Positive news has a positive affect on future prices. An extension of this concept can be made to analyze any type of event-based data source, including insider trading information. An analyst can then observe how equities behave on average after the occurrence of an event. We examine these signals using QuantDesk’s Event Analyzer software. Figure 3 shows this technique applied to the InsiderInsights Company Rating Data, where Bins 0 and 1 represent bearish sentiment (0 – More Bearish, 1 – Less Bearish) and Bins 2 and 3 represent bullish sentiment (2 – Less Bullish, 3 – More Bullish). Note that both of the bullish events show positive return, on average, after the event. Figure 3: QuantDesk Event Analyzer results for various insider trading events. Bin 3 and Bin 2 represent buying events, while Bin 1 and 0 represent selling events. As can be observed from Figure 3, the data seems to contain information on average. In addition, positive ratings are generally more profitable when compared to negative ratings. We will focus on positive ratings for the remainder of this paper and implement a long position only strategy to test the profitability of the positive indicator. The threshold from the above figure shows that any rating at or above 0.5 will, on average, result in a positive return. 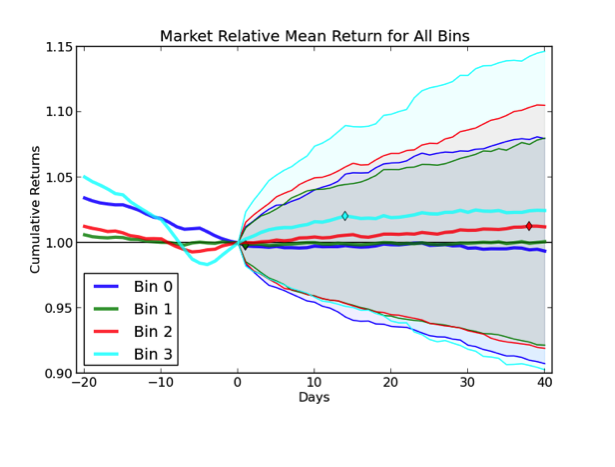 In addition to this, a holding period of approximately 15 days was determined to be an optimal mix between risk and return (denoted by the diamond markers for each bin). An event-based trading strategy was implemented using a full transaction-based simulation, including realistic modeling of transaction costs, using the threshold and holding period defined by the above event study. Figure 4: Back test of the event driven strategy discussed in the text. Performance of the strategy is illustrated in green. 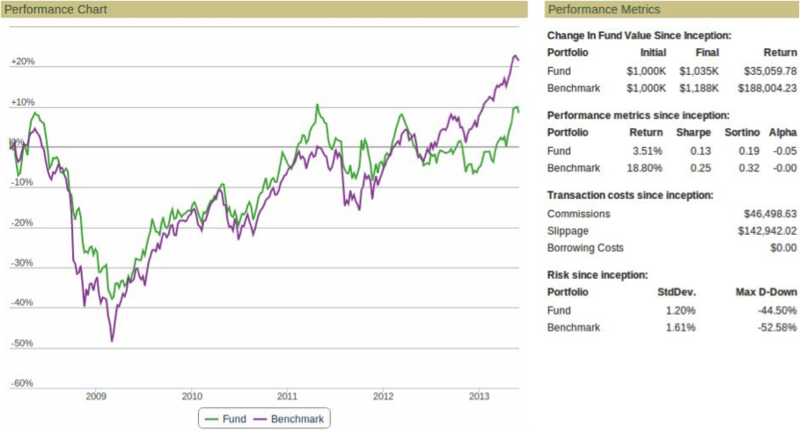 The purple line represents the performance of the S&P 500. The strategy simply purchases shares of companies that have had a new rating that is at or above 0.5 and exits the position 15 days later. In addition to this, a stop-loss and stop-gain of +/-5% was added to eliminate extremes on both the up and down side for each individual position. Each time an event is triggered 50% of the portfolio value is allocated (if less is available, the remaining amount will be allocated). If more than one event occurs on a single day, the total allocation for that day (50%) will be split evenly among all of the events that day (limit 10 events per day). Transaction costs are modeled with commissions of $0.0035 per share or $5.00 minimum, and slippage estimated at 5 basis points (bps) for each transaction (indicating that the price will move against the trader by 0.05% when entering and exiting a position). 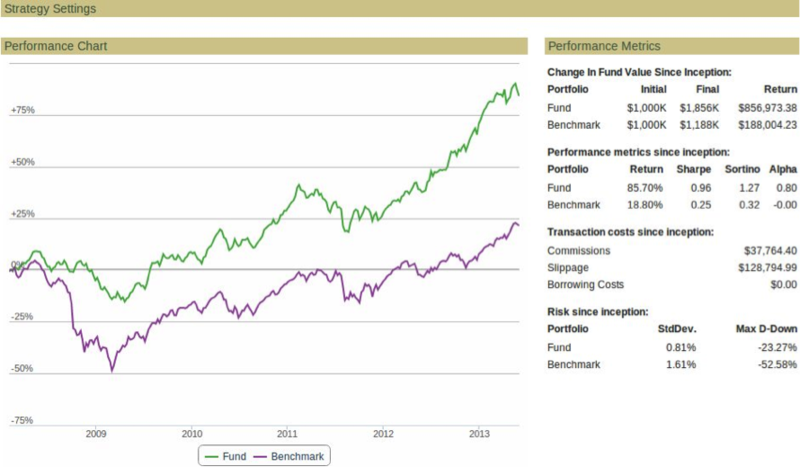 We present the performance of this strategy using the S&P 500 as a benchmark in the figure below. This back test shows very promising results, demonstrating that even with the presence of transaction costs, this strategy has alpha over the market with an average annual return of approximately 14%. Figure 5: Randomized control back test. As a control, a series of ten random tests were run to determine if any bias exists within the data. Each test uses the exact same distribution of rating data as the above test, but the data points are randomly scrambled within the database. A sample performance of the control experiment is provided below. Over the ten control tests, the average total return was 16.35% compared to the strategy’s 85.7% and the average Sharpe Ratio was 0.18 compared to 0.96 for the strategy. The performance of the control portfolios clearly show the alpha that is present in the data being used and the strategy implemented. More detailed back test reports, including specific transactions are available from Lucena Research upon request. An event study to show initial value in the data. A back test simulation using the defined threshold and holding period with transaction costs. It was shown that the defined strategy significantly outperforms the random control experiments. This suggests that there is information that can be successfully extracted and utilized in the InsiderInsights Company Ratings data. Accordingly, Lucena is pleased to now offer this premium dataset on our QuantDesk™ platform. On the other hand, increasingly, corporate employees experiencing downsizing or unfavorable work conditions may consider buying a franchise as a viable career option. Though buying a franchise has its advantages for the small business owner, it doesn’t come without its disadvantages. For more information, visit franchisesfor.sale. This is not investment advice. Tucker Balch and Scott Strong are not investment advisors.